You should always go to the last one first! You should cross all your bridges before you come to them! Life is too short for counting rivets! What happened to things that you dropped before Newton discovered Gravity? On16.5? Specify in the layout description what you are trying to represent. There was a layout called Murphy's Quay that used16.5 to represent Irish 3 ft gauge, but I cannot remember how the builder described it. best to specify scale(1/43.5), gauge(16.5?) and prototype gauge(3ft) if it is relevant. As an aside, I am planning a metre gauge layout using 16.5mm gauge, but in 1/55 scale.Still not as accurate as using 18mm gauge but I prefer to use cheap reliable mechanisms. I also model 60cm gauge in 1/35 using 16.5mm gauge and that is only getting through to those writing the exhibition guides. 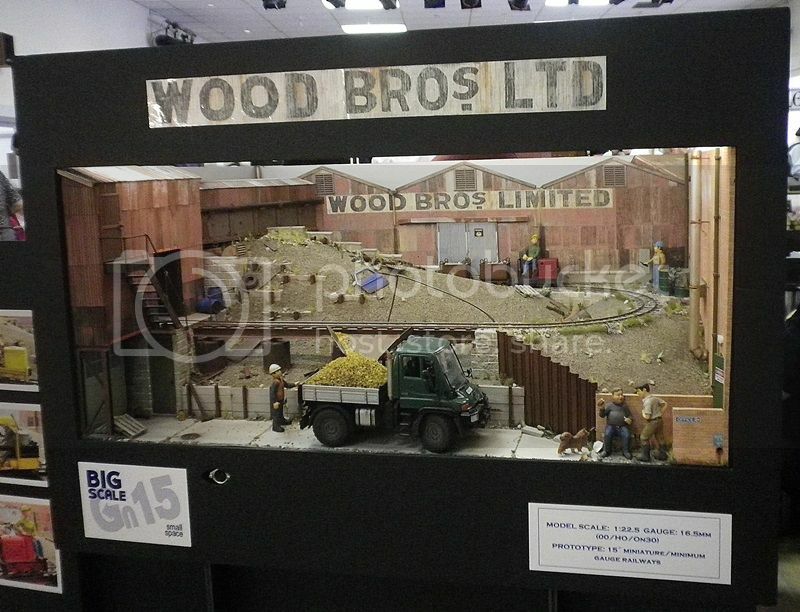 I have seen other similar scaled layouts listed as O scale. Unfortunately many(probably most) don't understand anything beyond OO, N an O gauge. Narrow gauge isn't even on the radar. I try to educate them though. O scale 3ft/16.5mm gauge, I do remember many years ago, one group/club building a large layout using this, mainly because of availability of track and chassis. There stil isn't much 21mm gauge around. Pity as it would serve both O scale 3ft gauge and 4mm scale, 5ft 3in gauge. I used to get the same sort of problem when exhibiting my US prototype 1:48 scale 0n2 (1/2" gauge) and 0n3 (3/4" gauge) layouts. Seemed to spend a lot of time at shows just explaining scale & gauge! When I exhibit, I consider I am not just there to entertain, but also to educate. There is far too much muddling between the words 'scale' and 'gauge', so personally I would say "scale- 1/43.5, prototype gauge - 3ft". I really should get a sign made for my WW1 layout, next outing is not till March. Will consider making a sign on layout which is going to exhibition in December. Practice what I preach. As Trevor suggests; Scale O gauge for benefit of the MRC. Then a info panel for audience (scale, model gauge and prototype gauge) as Bilco has done. I think they want the 'scale of the layout' to put next to the title when they list the layouts that will be appearing! i.e. Emley-Sous-Bois is a 7mm, 1-43.5 Scale, Narrow Gauge Layout set in the Esterel Forest in the South of France, it depicts the terminus station of a wooded branch line, part of a fictitious Meter Gauge Railway, the Lingostiere (Nice)-Saint-Raphael, (LSR). Snappy titles don't do our hobby any good. Exhibition managers often need educating on terminology. I sometimes have to look at exhibition listings to see if there is anything to interest me, and I know it is also a concern of magazine editors, as they often get complaints when they have listed inaccurate info in their magazines. I will have to start a campaign to have the terms gauge and scale legally defined, as it not only insults our language but mathematics. Just had a look round, and found that Pempoul by Gordon Gravett is described as 1/50th scale, 18.2mm gauge, and Christopher Payne describes some of his layouts as 1/25th scale, 16.5mm gauge. No mention of prototype gauge in exhibition details. So describe Emley-Sous-Bois as 1/43.5 scale, 16.5mm gauge. Also I am very interested in any French narrow gauge so any chance of a photo? I have never got round to registering with any of the Photo Web Sites, consequently my photo's are to large to use on this site. Also the layout is only about 90% complete (to what I want). At the moment the background trees are photo's, these are being replaced by flock/foliage trees. However the layout is more than acceptable to be exhibited in its present condition (and in fact has been). I can email some photo's if you/somebody could then add them to this site? Download xnview (free) Mike. You can then reduce size and use the Gn15.info photo loading system. I've used xnview for years after recommendation from SteveB. Any photos I show here are reduced in size using nothing more than Windows Paint. Maybe a bit crude, but good enough to view on forum. I also have my own web-space(paid for) mainly for my website but also a convenient place to store photos to show on forums. I tend to distrust free web-space given what has happened to some in the past.